Commentary on International Security: Emerging Scholars Perspectives. Much is made of the rise of China as a superpower these days, with comparatively scant attention being paid to the concurrent decline of Japan as the regions’ leading power and the impact of that slide down the global power tables has and will have on the Japanese people and Japan as a state. Two things are important to note from the start – one, that historically and certainly over the past few centuries, Japan has had the better of its regional rivals Korea and China and has in comparative recent history subjugated both via military conquest. The second core point is that the rise of China to superpower status – now surely undisputed as a reality in the near future if Beijing is not already acknowledged as such – will impact Japan more directly than any other state – including the United States. It is Japan that sits a stone’s throw away from China, Japan that is directly in line of the growing and increasingly assertive Chinese military, Japan that faces being sucked into the economic dynamo that China now is – finding itself usurped as the regional leader in every field. Indeed steps towards further economic integration, the one area where cooperation seems logical and desirable by all in the North East Asian region, are somewhat stymied by the fear amongst Japan and South Korea that in a free trade area, neither could complete with China on cost – thus seeing a sizable outflow of capital to maximize the benefit of China’s comparative cost advantage for Japanese and Korean producers. However this article deals not with the economics of China’s meteoric rise – but rather hopes to focus more on the political and social impact of the shifting power dynamics in East Asia. To gauge this, I rely partially on my own unscientific but tremendously interesting experiences. Many moons ago during my first incarnation as a doctoral student I struck up a friendship with a Japanese student enrolled on the same program. Perhaps we both subconsciously thought that the only other ‘Asian’ in the class would enable an easier friendship to emerge or perhaps he assumed I too was a foreign student who would be equally shy speaking in English before more obviously apparent ‘native speakers’- but none the less over time we became quite close and despite my zigzag journey though different programs and cities to where I am now, we remain good friends. I shall not give his full name as he is still on the program and I have no wish to embarrass him but Nish as I called him (Nishi was too much to say!) gave me a tremendous insight into the mindset of segments of the educated strata of Japanese society and how they both view and react to the sea geopolitical changes taking shape around them. To say he is a nationalist would be an understatement. His grandfather and granduncle fought and died in Iwo Jima in spring 1945, he had been taught to be proud of his roots and over the years has interned for politicians who now make up the second tier of Japan’s ‘Japan Restoration Party’ – a fiercely nationalistic outfit who govern Osaka and now have a few dozen MP’s in Japan’s parliament. The rapid national rise of the JRP is reflective of the mood of a particular set of Japanese of which Nishi is perhaps representative. Affluent, culturally aware and with a family tradition of military service, their concerns centre on the future of Japan – and I shall relate them as follows. Why they ask, nearly 70 years after World War Two ended; does the US still have troops in Japan? They see Japan as being occupied and sold out by governments to agree to humiliatingly one sided terms in bilateral US-Japanese ties. Why is Japan still governed by a constitution forced upon it after the War ended by the Allies? This constitution constrains Japan’s freedom as a sovereign state and leaves it at the mercy of the US in so far as security is concerned? Why is it wrong for Japan to honor their war dead yet the war dead of other countries are celebrated? Are Japanese war heroes less worthy of recognition? The undercurrent of frustrated nationalism in the Japanese may not remain so hidden should the feeling that their nation is being superseded by China become more apparent. World War Two and the subsequent political mechanics have bottled Japanese nationalism, have cut out from common conscience that history that glorifies Japan and emboldens the nationalistic Japanese. However, Japan may not wither into second tier power status quietly as some have expected. We have all seen the protests against US troops; against China when events transpire between the two and the rise of right-wing parties such as the JRP reflect the existence of a very real current of nationalistic rebirth evident in some Japanese. Somewhere in the national psyche of the complex Japanese people is that warrior spirit that made them so feared by Allied powers and so successful as an expansionist military power for centuries. It is my belief that the right external stimuli could well bring this characteristic back to the forefront should the Japanese people – who remain fiercely proud and xenophobic as even close Japanese friends will admit to ‘outsiders’ when they are being honest – feel they face permanent national loss of position and prestige in their region. It is this undercurrent of anger, frustration and regret that the Japan Restoration Party taps into and the same sentiments are expressed by even some amongst the most educated, worldly and sophisticated Japanese people. 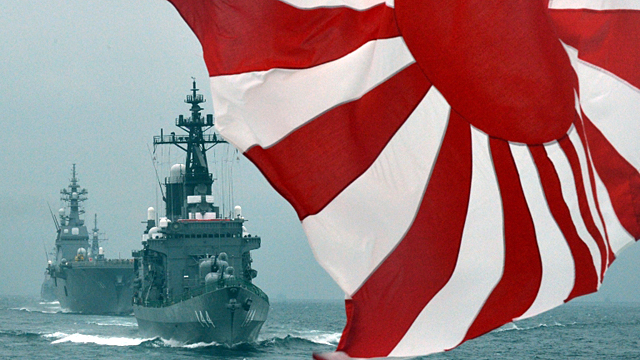 It is possible that Japan withers as a power or it may attempt to bridge the gap by investing heavily in its military and in reviving its’ still mighty economy to try and retain its regional leadership. However, should Japan wither, it is my understanding that it is unlikely that Japan will wither away quietly. Efforts are underway to try and open up the constitution to allow for some offensive military capability and just recently Japan inaugurated the largest warship it was had since its halcyon days of Empire in World War Two – a huge helicopter carrier named Izumo. As China becomes more assertive and expansionist – it should be ready to face stiff resistance from Japan, resilience lesser states such as the Philippines cannot possibly offer. I do not doubt that East Asia has seen a changing of the guard – a passing of the baton to a new primary power, but judging by political developments within Japan – and a renewed overt patriotism within an influential element of Japanese young adults – those who will tomorrow govern the nation on account of their education and noble blood, the Japan will to retain leadership remains. From a valued friendship I have learnt of a culture I knew nothing off, learnt to appreciate a finely crafted Masamune sword or the epics of Japanese literature – but as a political scientist, I have learnt most importantly to observe – not just the ideas of one friend, but a movement led by Japan’s youth – a youth who yearn for the power and prestige their ancestors once knew and enjoyed. From everything I take one core lesson – Japan’s youth will not surrender its regional status without a fight. This entry was posted in Uncategorized and tagged Japanese Chinese rivalry, Japanese Nationalism, Mohsin Zeb, Rise of China, Wither Japan by bwrholliss. Bookmark the permalink. With all due respect this article states a “rise” in Japanese nationalism. This “rise” has gone on since the early-mid 2000s yet I have never seen a “rise” rather normal Japanese nationalism which has existed since the existence of the modern Japanese state. Yes Japan has always had nationalists but the political organization of them into a viable and electorally successful party like the JRP is a new development. The article touches upon a forgotten reality, the reality that the Japanese are the natural masters of Asia. The Chinese are like dogs, grown big on power, but whose honour and integrity is lacking, they would sell their own brother for money. The Koreans are are a race even weaker in character and merit than the Chinese. They need us Japanese. Japanese nationalism has not truly risen, the spirit of Bushido that dwells in the heart of every Japanese is drowned by the wretched claw of America. The Japanese have forgotten themselves. The Americans steal and loot our greatest treasures, like the Honjo Masamune, and we are not infuriated by this dishonour. It sits catching dust and rusting in the greasy, unworthy clutches of an American, who knows not what he possesses, he cannot appreciate its glory and beauty. Every stolen artefact must be returned to our native land. Another sickness pervading our great and honourable nation is how baseball is our number one sport, what happened to honouring our mighty Sumo? The bastardisation of our great language is another sign that our nationalism has not risen yet. When the fire of our ancestors is rekindled, when the occupying Americans are removed, when our leaders (who dishonour the memory of our great fallen and war heroes, our great leaders like Minamoto-no-Yoshitsune) freely visit Yasakuni Shrine without backlash, without Chinese barking, when the occupiers constitution is destroyed, when we have nuclear weapons, when our great warships are rebuilt, then will our nationalism, the nationalism of old rise. A rise in the support for parties with greater nationalistic leanings is not a rise of nationalism, it is a reaction to the failure of our government, to its submissive pandering to America,, but it is an indication of the rediscovery of the TRUE Japanese spirit, the Samurai spirit imbued in every soul in our nation, so lost and buried in American pop-culture, in an idealistic view of the West. We were born to rule. In our great city of Kyoto is the To-ji, formally called the Kyõ-õ gokoku-ji meaning The Temple for the Defence of the Nation by Means of the King of Doctrines. The King of Doctrines is Bushido, this is our spirit. The Japanese cannot remain like this with the belligerent Chinese nearby, they cannot match our spirit, they are keen to keep our spirit suppressed, because in their hearts they know, if we are allowed to rise again, they would fear us again, fear our Bushido, like they did before. So, would Korea, and North Korea, would never dare threaten us, if we hadn’t become so weak. Japan will rise again properly, maybe not today, maybe not tomorrow, but someday, perhaps not even in my lifetime, but one day it shall, and when the dragon is awakened the earth will tremble. I am sympathetic to the arguments that 70 years post War, Japan need not have a US given constitution and the need for a strong military to protect Japan from a rising China, but your comment creeps into that extreme nationalism that made Japan dangerous. Chinese may not take kindly to such disparaging opinions of them. Clearly, – I’m judging this by your excellent English – you are an educated and patriotic Japanese. To expand my ‘field research’ beyond 1 friend – what do you make of the Japan Restoration Party? You talk as if some specific person holds your nations lost sword called Honjo Masamune. Is ths true? Why so much hate for that person? I dont think they were the person who actually carried it off. Hi Wade, my understanding is that the Honjo Masamune is the name of the sword. It was taken by American servicemen after WW2 and the Japanese badly want it found and returned. It is perhaps comparable to someone stealing Lincoln’s hat – deeply symbolic. Thanks for your reply. I am very curious. Whether they want it back for free or will pay a reward, I simply dont know. Josh, with a GDP of some 5-6 trillion USD, a population of 120 million or so, an advanced and growing military and as the world’s hi-tech center, Japan is far from having “no power”. It is a serious world player – yes, not akin to USA, China or Russia but its amongst the next set of powers – like France, UK, Germany et al. Josh, simply put you are wrong. As Mohsin has mentioned Japan has great assets, financially, technologically and militarily, look at ShinShin for example. But more so, your comment betrays your anti-Japanese position. Japan was a great power before America and shall be again after it. The support of the JRP is a reaction to the failure of our weak government, and their subjugation to America. The JRP has moved the discourse of Japanese politics to the right. However, the rekindling of Japanese nationalism shall not be reborn until the spirit of our nation is rekindled. As long as we are as the noble Toru Hashimoto-san said “america’s mistress” we shall never rise, but where is the justice in the status quo? Why should America dictate that we can only spend 1% of our GDP on our military? Why should there be thousands of occupying American troops on our soil? Why should we have to bow to America? How is this fair? Do they still perceive us as a threat? We are capable of forging our own path, it has been 70 years. Just because you can’t see beyond your own western endorsed perceptions of our great nation, do not count out our nation. It shall manifest itself. Japan leads the world in robotics and many other fields, and if we are allowed to spread our wings the world shall see. This is not a false nation perpetuated by nationalists, it is a fact. Mohsin, thank you for your warm reaction to our great nation, but though Japan may not approach Chinese levels of wealth, if the political and mind-forged manacles imposed upon our great nation are lifted we shall never be caught technologically, and China shall think thrice before insulting us. Our politicians are to blame, their grandparents and parents grew up under the American thumb, and it is all they have known, it has imbued itself upon their mentalities, this cannot be allowed to project upon our youth, and this what our nationalists want to stop, and this is a priority. I agree with Itto-san. Japan must tear off the shackles imposed after 1947. This sad and hateful subjugation was predicted by the great Mishima Yukio who bemoaned the loss of the samurai spirit of Bushido in the once great land. He tried valiantly to rouse the Army through both his work (especially the Sea of Fertility tetralogy) and deed, taking his own life honourably by seppuku when his attempt to rouse the nation failed. We cannot assume our Western values hold true for the Japanese. Owen did indeed write ‘dulce et decorum est, pro patria mori’ – his harrowing account of being gassed in the trenches of France during WWI. But it was a poem slamming (not supporting) the British Establishment and others for propagating “the old lie” that it is sweet and noble to die for your country. G, the point is that dying for your homeland was once deemed honorable by all peoples. The Japanese were not unique in that former understanding. 1600 years elapsed from when the Romans marched and advanced with ‘dulce et decorum est, pro patria mori’ as a battle banner to WWII. Post fall of the Roman Empire, soldiering, a noble profession for many states remained just that- a paid profession, a job. During the twentieth century Japan was unique. (You can’t compare the defence of the Soviet Union to Japan, the Soviet troops faced a choice of dying advancing towards enemy guns or being shoot by the NKVD for retreating). Good evening. I cannot believe you typed “during the C20th Japan was unique” – as if Japanese nationalism was the most destructive of the century. Undoubtedly, it was the Nationalisms that engulfed Europe in the 20th century that wrecked the most untold horrors on this Earth. Compared to the Germans, the Japanese were saints who showered the lands they conquered with roses! In actuality, the Japanese did commit some war crimes, but nothing compared to the crimes European nationalisms unleashed. I must type honestly, if I was Japanese I would wish for my land to be free from foreign troops and for my nation to be allowed its full measure of freedom. At this time Japan is denied both rights. Evening Mohsin. The uniqueness to which I refer isn’t nationalism but your reference to suicide in defence of the homeland- hence my mention of the Soviet Union. You mention disbelief at what I typed, but you think to state “Compared to the Germans, the Japanese were saints who showered the lands they conquered with roses!” is acceptable? I don’t know what your background is but would question whether you know very much about Asian history, I wonder whether the people of China would so readily agree with your saintly flower wielding depiction of their conquerors! To be clear, I never said the Japanese were ‘saints’ – just compared to the Germans they were. Japan was responsible for hundreds of thousands of deaths – and that is horrible, but compared to the 20 million or so German aggression caused, its comparatively small. The Japanese are a strange people – I mean this not as an insult, but in an attempt to explain their socio-cultural make up. They do not think like we in the West do. They have different trends and barometers of success on a social scale. As for my background, I am a US specialist with a B-side in South Asian strategic affairs. Firstly, Nazism killed and was far more despicable than any other form of ultra-nationalism. And America has invaded and bombed more countries than any other, it bullied countries at will, but because its American “democracy” it’s legitimate? I think you don’t know Asian history, China needed and needs Japanese overseers. But, comparing Japan’s noble warriors to others is simply a sign of a lack of knowledge. They fought in a war, things happen, they were outgunned, and outmanned and nuked, but carried on fighting. You said you cannot have a discussion with those who think suicide is honourable, your mind about our nation is clearly made up, our nation, still has the highest suicide rate, as we still think it honourable, so you can’t have discussions with us? You clearly don’t understand the concept of suicide in our culture, you will never understand us! If you know of the hongo’s where abouts, please let me know or put me in contact with those who do. I would be happy to use any means I can to facilitate the return of this priceless artifact to Japan. Burying it will ruin it!